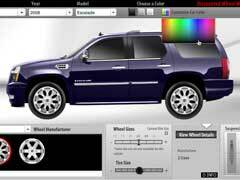 Wheel Visualizer Software - 7 Things You Need To Know! Wheel Visualizer Software – 7 Things You Need To Know! One of the most innovative tools many auto parts websites offer is a wheel visualizer. This is an application that allows you to select tires and accessories for your ride from a variety of manufacturers. Like any tool there are some things you need to know before using a virtual wheel visualizer. 1. For one, you will need to know your tire’s size. When you use the wheel visualizer one of the search methods is by tire size, therefore knowing this beforehand can ensure you select the right ones for your car. 2. While the tool gives you a variety of options like where to buy your muscle car rims, it’s important to note that each store may charge a different price. This is especially the case when factoring in the costs of wheels or freight. 3. Before using the wheel visualizer you’ll want to research what is the appropriate finish for your car. There are many different kinds available so by learning more about each type you can select the one that will be the most durable for you. 4. The wheel visualizer isn’t the best way to comparison shop. While it’s true you can check out different prices you’ll want to do additional research to determine which brands are the best to buy. There are many good websites like Tire Rack that have educational articles on who are some of the best quality manufacturers. 5. Another factor you’ll want to consider is ride height. Say you want to buy classic car rims for your hot rod, you’ll need to know measurements like this as it can help you select the proper sized accessories. 6. This tool gives you so many different options to buy products like custom truck wheels. With that said, not all items the tool suggests will be suitable for the vehicle. By doing some research beforehand and knowing what you need for size and suspension it will ensure you select the most appropriate equipment for your ride. 7. Lastly, treat this for what it is a design tool. While this is a great method for visualizing what your ride can look like nothing will replace seeking a knowledgeable mechanic or auto parts expert as they can help you make sure you have all the items you need to make the adjustments successful.